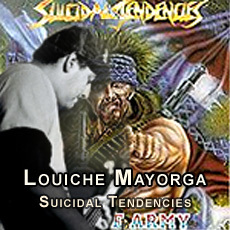 Suicidal Tendencies were formed in 1981 and Louiche Mayorga joined the band as bassist one year later. He played on their first, self-titled album, "Suicidal Tendencies," and also on "Join The Army." Mayorga left the band in 1987. He appears on the 1997 collection "Prime Cuts: The Best of Suicidal Tendencies." After Suicidal he remained active in the local Venice music scene, working with Uncle Slam and Horny Toad!, among others. He most recently joined up with fellow ex-Suicidal members Grant Estes and Amery Smith, as well as Excel vocalist Dan Clements and former No Mercy singer Kevin "The Jerk" Guercio, to form a new band called AgainST. He also produced "Welcome 2 Venice" a punk compilation featuring 14 bands and 16 tracks on his label Built On An Ounce Records. More info can be found at www.builtonanounce.com.As of April 2010, Mayorga has joined Beowülf, who has been working on a new album, entitled Jesus Freak.